the guts to just die before they got old! singing “Who knows where the road may lead us? the humming of a personal angel. This poem originally appeared in slightly different form in Nebo. Go here for a list of poems and poetry commentary on this site. 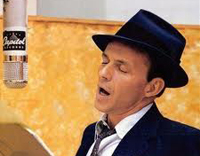 This entry was posted in Poetry and tagged Frank Sinatra, Poems by Richard R. Guzman. Bookmark the permalink.